Nobody can shed a light on the cruise industry hiring process better than company hiring managers. 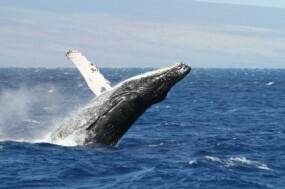 Here's our exclusive interview with a human resources manager at the Pacific Whale Foundation. Is this the company for you? Do you have what it takes to get hired? Find out! Become a CruiseJobFinder Member to access the entire interview. Describe what your company does. What is your role in the staffing process? The Foundation is a non-profit organization offering educational, eco-focused cruises and tours around Hawaii that aim to inform people about the natural habitats. The eco-adventure cruises we offer have won awards. We offer sunset cruises, dinner cruises, snorkel cruises, whale and dolphin cruises, raft cruises, holiday and special cruises, and more. I review applications and schedule interviews. Naturalists and pursers are needed all year round. Crew, servers, and bar tenders are frequently needed as well. We offer competitive salary, great benefits and the opportunity to do meaningful work in a dynamic organization with lots of growth potential. We hire lots of seasonal staff for the tours, mainly as assistants, servers, and crew. Yes, just the pure love of nature attracts them - it gives them the sense of having a dream job, and is something that they will remember forever. We need people who love the environment and who can work on a team easily. You must be pleasant, well dressed, well spoken, and confident. We offer full time, part time and temporary positions. All applicants must undergo a drug screening test and agree to a full background check. Drug, Medical, Dental, Vision and Alternative Medicine Insurance, Paid Holidays, Vacation, Retirement Savings Plan, Sick Leave, Merchandise Discounts - Up to 40% off at our retail stores, Complimentary Cruises as well as other incentives and bonuses. We train employees in customer service and help them with customer relations skills. People that come to us are generally there to learn and to be part of an exciting eco tour. People who like to travel, who enjoy adventure, and who like learning about and researching wildlife and marine life will suit these jobs.